Tom Stonehouse, Kevin Butler, Colin Marshall and Michael Jones netting the vital goals in Wilstead’s third straight win against Town replies via Ian Buckingham and Ritchie Bevan. Now in second are Shefford Town & Campton who maintained their unbeaten home record with a 3-0 victory over Stevington, Chris Clark netting twice and Jake Renney once. Whilst in third are AFC Kempston Town & Bedford College who ran out the 6-2 winners at Ickwell & Old Warden who were suffering their fourth home defeat on the bounce. Courtney Boughton with four goals was joined on the Town scoresheet by Colby Smith and Daniel Green against home replies via Ashley Drummond and Zak Rowe. Also enjoying life on the road were Caldecote who extended their unbeaten run to four games with a 5-3 win at Wootton Blue Cross. Jack Boyd with a hat-trick led the way, joined on the scoresheet by Adam Legate and Dan Fennell to bring up the nap hand against home replies from Chris Butler twice and Matt Gurney. Whilst still unbeaten on the road this season are AFC Oakley M&DH who shared the points in a 2-2 draw at Ampthill Town Reserves. Jack Fuller plus a Ross Airson penalty marking the home scoresheet against a strike from Ali Smith plus an own goal marking the M& DH scoresheet. For Sharnbrook it was home win number one of the season with a 4-0 victory over Marston Shelton Rovers. Jim Burnside with a brace was joined on the home scoresheet by Simon Denton and Zach Ives to ensure Rovers remain just one place off of the bottom of the table and still looking for their first win of the season. Whilst it was also home win number one of the season for Cranfield United the 3-0 winners over bottom of the table Sandy were were suffering their seventh defeat on the bounce. Martin Holland with a brace and a strike from Luke Gray did the damage. Elsewhere Renhold United took their unbeaten run to six games with a 2-1 home win over Kempston Rovers Development. Johnny Richens and Alex Liburd were the United goalscorers against a lone reply from Aaron Sabey to leave the Rovers still looking for their first away win of the season. We also have new leaders at the head of the Division One supported by Wests Citroen Bedford league table in the shape of Queens Park Crescents who maintained their 100% home ways with a 2-0 win over Shefford Town & Campton Town Reserves thanks to a brace of goals from Daniel Rasol. The Crescents took over that top spot on goal difference from Meltis Albion whose unbeaten ways came to an end when defeated 4-3 at Totternhoe Reserves who now occupy third place in the league standings. It was the home side who were the quickest out of the blocks at Dunstable Road and with just five minutes showing on the clock thanks to a brace of goals from Jonny Clarke the scoreline read 2-0 in their favour. On 18 minutes the Albion, via a penalty from Craig Damon, reduced the arrears to 2-1 only to see Daniel Woosley restore the home side’s two goal advantage just eight minutes from the break. Clarke was then to claim his hat-trick in the 70th minute to make it 4-1 and it was seemingly game over until a second goal from Damon 11 minutes from time and a strike from Scott Alleyne eight minutes later left the final scoreline to read 4-3. Up into fourth and still unbeaten are Crawley Green Reserves who ran out the 5-2 winners at Westoning. Adam Marsh and Aaron Browne both netted twice alongside a single strike from Robert Newman to bring up the nap hand against home replies via Tom Cooksley and Rob Cooksley. Missing the chance to join the top three on 13 points were Henlow who now occupy fifth place after they lost their unbeaten ways when beaten 2-1 at M&SH Clapham Sports who duly climbed the table into sixth spot. Liam Bolton and Sam Maddix were the home marksmen against a lone reply from Paul Wright. Elsewhere there was a first win of the season for Cople & Bedford SA, the 4-2 home winners over the previously 100% on the road Elstow Abbey. Ollie Hughes, Kieran Willis, Ashlee Banton and Paul Nigro scored the home goals against Abbey replies via Danny Pilgrim and Shaun Cafferty. Meantime AFC Kempston Town & Bedford College Reserves were to be gifted the three points when Ickleford failed to raise a side to visit them at their Wixams base. Wixams’ lead at the head of the Division Two league table remains at four points despite them being held to a 2-2 draw at Caldecote Reserves. Tom Wallace found the net twice for the home side against Wixam replies via Gareth White and Terry Stanley. All this came after second place Lea Sports PSG failed to close the gap after they themselves were held to a 1-1 at Flitwick Town Reserves. Joe Hennem was on the PSG scoresheet against a Town reply from Chris Bull. Now in third place, just goal difference behind PSG, are Riseley Sports who maintained their unbeaten away ways when winning 5-0 at bottom of the table Sundon Park Rovers. Jake Hislop with a brace was joined on their scoresheet by Jack Healy, Mitchell Crook and Jamie Simmons to bring up the nap hand. Whilst now in fourth and again just goal difference behind the Sportsmen are Cranfield United Reserves who won 1-0 at Atletico Europa to end the home side’s 100% home record. Antonio Ricciardi netting the all important goal. Also losing their seasons 100% home record were Kempston Hammers Sports who were beaten 4-3 by a Potton Town side claiming their first away win. Chris Cooper with a brace joined on the Town scoresheet by Chris Moore and Jordan Thomas against Hammers replies via Chris Greene twice and James Slater once. Elsewhere for AFC Oakley M&DH Reserves it was a first home point of the season in sharing the spoils in a 2-2 draw with Houghton Athletic. Justin Muircroft and Nathan O’Halloran were the home goalscorers against a brace in reply from Sam Martin for the Athletic. With leaders Kempston Athletic not in action their lead at the head of Division Three is now down to goal difference only after Wilstead Reserves won 5-2 at bottom of the table Wootton Village. Luke Pursey and Sam Ward both scored twice and Andrew Stapleton once to bring up the nap hand against Village replies via Lewis Aitken and Adam Flynn. Whilst for third place Marston Shelton Rovers Reserves it was a 3-2 home victory over Sandy Albion. Kieran Day with a brace plus a single strike from Gary Russon did the damage against Albion replies via Luke Rudd and James Smart. The biggest win of the day went the way of Renhold United Reserves who claimed their third win on the bounce with a 5-1 victory at AFC Dunton who were duly losing their unbeaten home ways. Michael France and Tom Skinner with braces plus a single strike from Thomas O’Neill marked the United scoresheet against a lone home reply from Laurence Frederick. Whilst losing their 100% away record were Bedford Albion who were beaten 3-1 at Shefford Town & Campton A who were duly collecting their first home points of the season. Sam Kelly, Liam Radley and Dean Linsell scored the vital goals against a lone Albion reply from Paul Kemble. Elsewhere with White Eagles failing to raise a side to visit Harvey Close their intended hosts Caldecote A will be duly gifted the three points. CS Rovers’ lead at the head of Division Four is now down to a single point after they were beaten 3-1 on home soil by fourth place Clifton. Josh Angell, George McMillan and Andy Harvey were on their scoresheet against a lone home reply from Daniel Gallagher. The gap was closed by Dinamo Flitwick who maintained their 100% away record and unbeaten ways when winning 2-0 at Flitwick Town A thanks to goals from Ashley Burton and Rhys Hughes. Whilst for third place Henlow Reserves it was a 4-1 home victory over now bottom of the table Lidlington United Sports. James Campbell with a hat-trick was joined on the scoresheet by Jonathan Rowe against a lone United reply from Alex Roberts. However the biggest winners of the day were AFC Kempston Town & Bedford College A who ran out 9-0 home winners over Harlington. 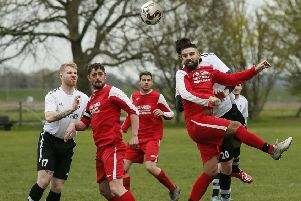 Gavin Cheema and Giovanni Moscaritolo both claimed hat-tricks, Michael Stephenson helped himself to a brace and were joined on the scoresheet by Harry Kemp. Whilst Sandy Reserves are still looking for their first home points of the season after going down 3-1 to a Stevington Reserves side duly collecting their first away points of the campaign to lift themselves off the bottom of the league tablem Cameron Cain netting all three goals against a lone home reply via Andy Barker.